1. To attack someone, or someone’s reputation, character, or good name by making slanderous or libelous statements. 2. To charge someone falsely or with malicious intent. A person who attacks the reputation of another person with slander or libel. 1. A child whose behavior, questions, remarks, etc., embarrass older people: The little boy indicated his character as an enfant terrible when he embarrassed his parents by mentioning that they said something bad about their guest. 2. Someone whose unconventional or controversial behavior or ideas shock, embarrass, or annoy another person or people; a person who is indiscreet or lacks a sense of responsibility: There are those who feel that some talk show hosts are extending their former juvenile characteristics as enfants terribles into their adult behaviors. 3. 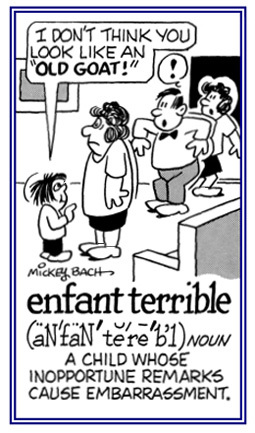 Etymology: from French; literally, "terrible child". © ALL rights are reserved. Descriptive of being foreign to an occupation or outside the ordinary limits of a career interest or responsibility: Because there weren’t enough music teachers at the school, those who were extraprofessional or nonprofessional in music were asked to teach this subject in certain grades . 1. A short story with an objective of pointing out good behavior; especially, one in which the characters are animals: "Usually a fable was told to teach a moral lesson for people to achieve." "The teacher told her students the fable about the fox and the grapes." 2. A story about supernatural, mythological, or legendary characters and events: "Aesop's fables have given us such useful expressions and sayings as sour grapes, and one good turn deserves another good turn. 3. A false or improbable account of something: "Ervin's story about his pirate ancestor is probably another one of his fables." 4. Myths and legends (fables) collectively. 5. Etymology: from Old French fable, from Latin fabula, "story, play, fable"; literally, "that which is told", from fari, "to speak, to tell"; related to Latin fama, "talk, rumor, report, reputation." Greek phama, "fame", and phanai, "to speak", are also related to Latin fari. Fables, a collection of stories attributed to Greek writer Aesop (c. 6th century B.C.). Many of the tales feature animals as characters and each one illustrates a specific moral. It is traditionally said to be the origin of the literary fable (although earlier examples have been found), they were used by the ancient Greeks for both educational and rhetorical purposes. We should distinguish between the fable and the myth. A fable is a story, like “The Fox and the Grapes”, in which characters and plot, neither pretending to be real nor demanding believability, are fabricated as the vehicle of moral or didactic instruction. Myths, on the other hand, are stories of anonymous origin, prevalent among primitive peoples and by them accepted as true, concerning supernatural beings and events, or natural beings and events influenced by supernatural agencies. Fables are made by individuals; they may be told in any stage of a nation’s history. They are vessels made to order into which a lesson may be poured. Myths are born, not made. They are born in the infancy of a people and their culture. Maria Leach, Editor; Funk & Wagnalls Company, page 361; New York; 1949.
pages vii-xii, Introduction; New York; 1964. 1. A short story that is usually about animals and which is intended to teach a lesson: Lynn's favorite Aesop fable is about a fox and some grapes. 2. A story or statement that is not true: Carmela combines fact and fable to make her novel more interesting. A minor fault in someone's character or behavior: Each of us has some little foible which can be very amusing. As a storyteller, Dudley often used a fable to illustrate a charming foible in a character’s personality. Famous for being described or recounted in legends: "There are some people who still believe in the fabled Loch Ness monster." 1. Presenting an event, or events, as a story or fable. 2. Telling invented or untrue stories. 1. The composition of fables or stories; especially, those in which the element of creative imagination is dominant: "A style of modern fiction consisting of inventions and imaginations." 2. 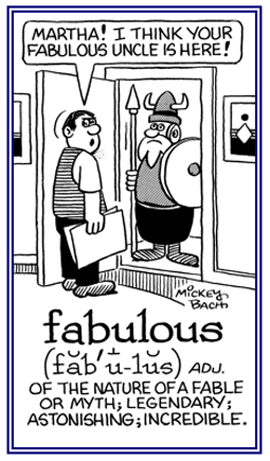 Etymology: "from Latin fabulat, narrated as a fable; from the verb fabulari, "speak, say." 1. Someone who tells lies or falsehoods: Sometimes Jack was a fabulist as when he presented phony reasons for not going to school by saying that he was sick even though he was not. 2. A narrator who recites tales or tells stories ending with a moral: Steven was considered to be a great fabulist and so he was asked to entertain a group of friends with supernatural myths and legends when they got together in the evenings. © ALL rights are reserved. 1. Extremely good, pleasant, or enjoyable: Lynne was told that she did a fabulous singing performance. 2. Amazingly or almost unbelievably great or wonderful: Bert's business grew increasingly profitable, earning him a fabulous wealth. 3. Relating to the contents of imaginary myths or legends: Everyone should read the story of “The Flight of Icarus”, which describes the fabulous flight of Daedalus and his son Icarus by using great wings made of feathers. © ALL rights are reserved. 1. A reference to being amazingly, or almost unbelievably great, or impressive. 2. Relating to, or describing, that which is typical of myths and legends. 3. Characterized by being extremely good, pleasant, or enjoyable. 1. The condition of being very well known. 2. Someone’s reputation or a situation whereby a person is known, or talked about, by many people; especially, because of notable achievements. 3. Etymology: from "celebrity, renown", which came from Old French fame, from Latin fama, "talk, rumor, report, reputation"; literally, "saying", from the stem of fari, fatus, "to speak"; related to fateri, "to confess", fabula, "narrative, account, tale, story", fas, "divine law". 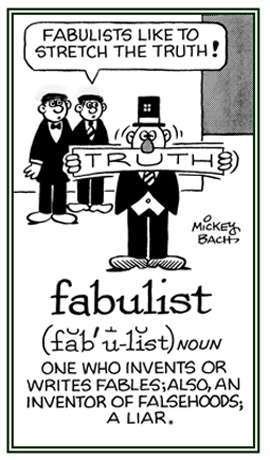 fabulare was the colloquial word for "speak, talk". Very well known about and by many people; renowned. Known and recognized and talked about by many people: "Multitudes of tourists go to see the famous Eiffel Tower in Paris." Cross references of word families related directly, or indirectly, to: "talk, speak, speech; words, language; tongue, etc. ": cit-; clam-; dic-; -farious; glosso-; glotto-; lalo-; linguo-; locu-; logo-; loqu-; mythico-; -ology; ora-; -phasia; -phemia; phon-; phras-; Quotes: Language,Part 1; Quotes: Language, Part 2; Quotes: Language, Part 3; serm-; tongue; voc-. Cross references of word families that are related directly, or indirectly, to: "divination, diviner; seer, soothsayer, prophecy, prophesy, prophet": augur-; auspic-; Fates in action; futur-; -mancy; omen; -phemia; sorc-, sorcery; vati-. Showing page 2 out of 5 pages of 75 main-word entries or main-word-entry groups.